The Strumpet Loves the Feminist Zine Fair NYC at Barnard College! Editrix Ellen here! 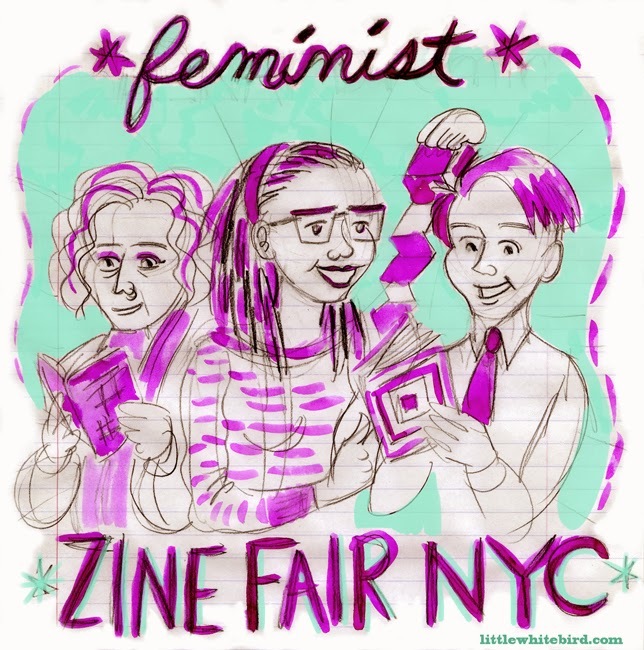 This past weekend I had a blast at the Feminist Zine Fair at Barnard College, a great show organized by Barnard students and library personnel. I LOVE zines - the first comics I made were IN zines - and I was so pleased to see the great stuff that's out there in all its photocopied glory. Repping for The Strumpet is always a pleasure, and I met lots of cool folks like Jennifer Camper, Edith Carron, Barnard librarian Jenna Freedman, Annie Mok and the ladies behind Happiness Comix. The folks behind this great fair are trying to raise some cash to bring a zine librarian of color to an upcoming conference, The Zine Librarian Unconference. If you want to support the great work the zine librarians of Barnard College are doing to keep this amazing artform documented and available for scholarly research (not to mention artistic inspiration! ), drop some dollars in their collection box - there's a whole blog post about the initiative here. I hope to see you next year, Barnardians! Thanks for a great day.